Do you want to see a smile on the face of your children? Do you want to make their childhood more special? If so, just buy playground equipment for them. Now-a-days, there is a huge demand of playground equipment and parents from all over the world are purchasing them for their children. The reason behind this is that playgrounds play a very vital role in the lives of children. Physical Benefits: Modern playgrounds often have recreational equipment such as swing set, jungle gym, seesaw, chin-up bars, ladder, merry-go-round, and sandbox, etc. 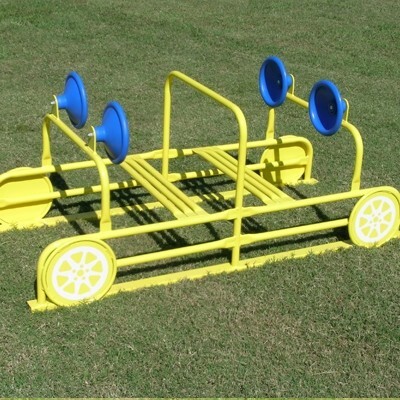 The equipment plays a very important role to develop physical strength among children. By doing the physical activities like running, crawling, jumping, sliding, and swinging, etc. children get a chance to be active, improve their motor skills and coordination. Mental Benefits: Besides physical strength, playground helps the brains of children to develop. According to the experts, the first six years of life are very important. The things which children learn in this phase will remain with them throughout their lives. So, for the mental growth of the children, it is important to utilize these years. Social Benefits: Involving children in the playground activities make them socially active. They will get a chance to interact with a number of other children with whom they can share their experiences. With this, introvert children also get enough chances to remove their hesitance and can easily communicate with others. Self-Confidence: It is often seen that most of the children lack self-confidence, which is a very important component in one's life. By learning new activities like climbing and sliding, the self-confidence among children increases. This self-confidence also helps children in other areas of their lives such as while communicating to others, they will not feel shy and can continue the conversation for long. Preschool outdoor play equipment helps children to learn the things quickly, which is difficult to learn otherwise. Many experts have also advised that, children should frequently take part in the activities related to playground. This will help them to develop their personalities at the early stage of their lives. How to Make a Safe Playground for Kids?